Inthe Middle Ages, the Roman Catholic Church was by far the largest vineyard owner in Mosel. To this day, vineyard names there reflect that history. The Graacher Dompropst (Dean of the Cathedral) vineyard is located in the center of the former Catholic holdings; its name refers to the fact that tax income from this land went to the highest ranking official of the Trier diocese. The vineyard is surrounded by the Himmelreich (Kingdom of Heaven) vineyard, a reference to conditions that produce truly heavenly wine. 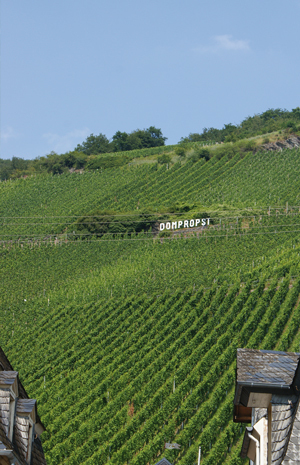 In Burgundian terms, the Himmelreich can be seen as a “premier cru” vineyard, while the Dompropst would be a “grand cru” site. With excellent southwestern exposure, the vineyards of Graach directly neighbor those of Wehlen. However, due to millions of years of alluvial deposits from the Mosel River, the Graach mountainside has a much richer, more fertile terroir, with an excellent watersupply. 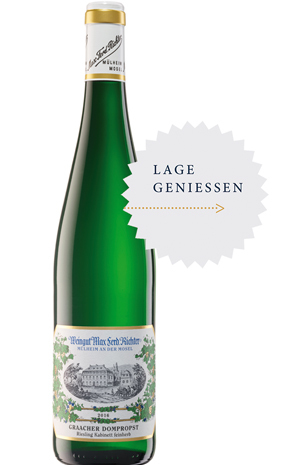 The wines of Graach are thusly vigorous, juicy, mouth-filling and with broadshoulders, with lots of citrus, floral and dried herbal notes as well as a luscious complexity of minerals, slate and flint.